While nearly half of Fortune 500 companies – 48 percent – have at least one climate or clean energy target, today’s sustainability professionals are tasked with reducing the impacts across their entire value chains. 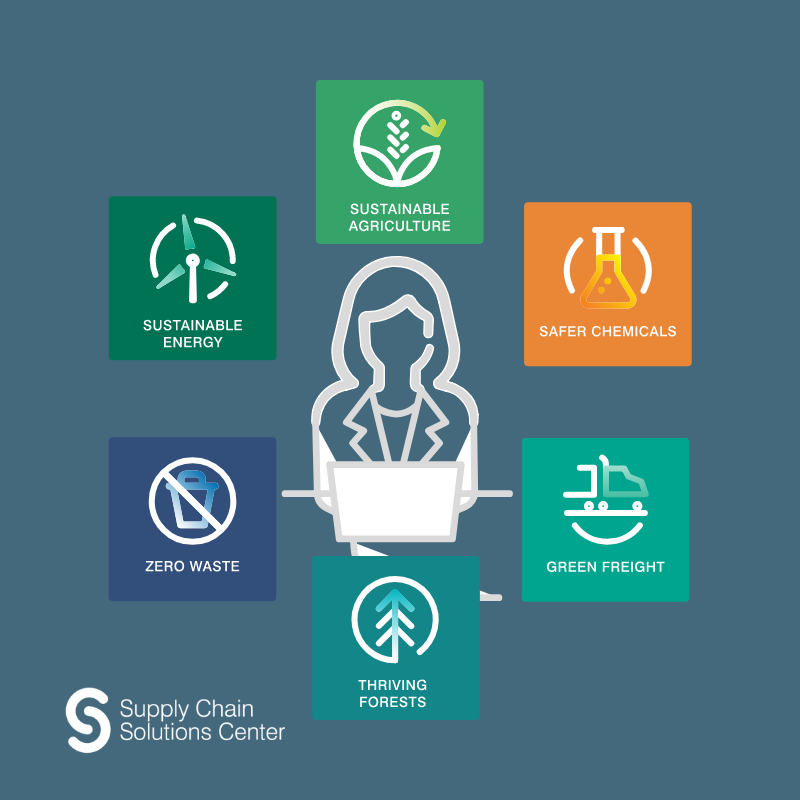 The Supply Chain Solutions Center, developed by Environmental Defense Fund in collaboration with over 10 organizations, will guide sustainability professionals in their efforts to mitigate the environmental impacts of supply chains. Globally, consumer packaged goods supply chains are responsible for over 60 percent of greenhouse gas emissions and two-thirds of tropical deforestation. Beginner, intermediate and advanced guides for understanding the six sustainability areas, creating a sustainability plan and achieving corporate sustainability goals. Case studies from companies such as Smithfield Foods, IKEA and Panera Bread Company that detail how the companies have accomplished environmental goals. Model corporate chemical policies for retailers, grocers or brands to show a public commitment to safer chemicals, improve supply chain transparency, cultivate informed consumers and embed safer product design. Users can also take an assessment to evaluate their sustainability efforts to date in order to find the most appropriate resources and they can create tailored profiles that will suggest relevant content from verified contributors. These contributors include Conservation International, CDP, BSR, the Sustainable Packaging Coalition, The Sustainability Consortium, ReFED, Field to Market: The Alliance for Sustainable Agriculture, Sustainable Purchasing Leadership Council, Further with Food, Shelton Group and GreenBiz. Shelton Group, a communications firm that frequently polls Americans to understand the drivers and obstacles to adopting sustainable products and behaviors worked with EDF to create the Supply Chain Solutions Center. "We’re honored to continue our longstanding partnership with EDF, helping them make complex topics simple and overwhelming amounts of information digestible. That’s what we’ve accomplished together with the Supply Chain Solutions Center,” said Suzanne Shelton, president & CEO, Shelton Group. “Sustainability professionals now have an intuitive, easy-to-use resource where they can quickly filter and find rich content and tools related to the aspects of supply chains that they’re working on. We believe the Supply Chain Solutions Center will be an important building block in mainstreaming sustainability inside companies large and small, and we’re thrilled to have created this with EDF." Environmental Defense Fund (edf.org), a leading international nonprofit organization, creates transformational solutions to the most serious environmental problems. EDF links science, economics, law and innovative private-sector partnerships. Connect with us on our EDF+Business blog, LinkedIn, EDF Voices, Twitter and Facebook.